If I were ever asked which of Microsofts products I like most, I would immediately know the answer. 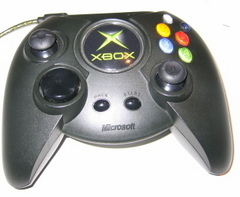 No software thing, forget the keyboards and mice, nope, I am quite fond of the Xbox-controller they designed. Yes, the black one that initially came with the original Xbox, which was mostly ridiculed as being too big. Well, my hands are quite large and happen to be about the right size to fit the original Xbox-controller in. The original Xbox was quite a closed system. That's reflected in the gamepad. If you want to use the gamepad for anything else than an Xbox, you have to do two things. First of all: while the signals to the pad are plain ole USB, the connectors aren't, so either an adapter cable or plain old chopping off the cord and soldering an USB-cable to it is needed to let the pad talk to something with a normal USB-port. Secondly, the controller doesn't adhere to the HID-standard, which is the standard normal PC-USB-gamepads work in. This means you have to install an extra driver. While Linux usually has the driver on-board, if I wanted to play with a friend of mine, I always had to ask him to install the not-too-stable Xbox-driver. Lately, this has become even more difficult: some of my friends run Vista 64bit, and with the driver signing stuff it has, installing the xpad-driver becomes next to impossible. Recently, I decided to end the custom-driver-hassle once and for all: one way or another, I would mod my Xpad into being an ordinary hid-standard, no-drivers-needed USB-pad.